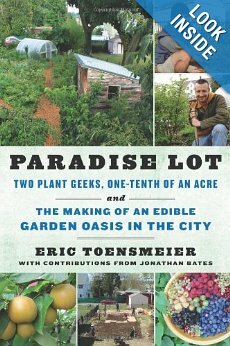 In Paradise Lot, two self-described plant geeks, Eric Toensmeier and Jonathan Bates, tell the charming story of their efforts to build a backyard food forest in the city using permaculture practices which had been implemented successfully in Europe and the tropics. They begin with the purchase of a duplex in Holyoke, MA, surrounded by a 1/10th-acre lot of weedy, rubble-filled, compacted soil, and a plan to develop an integrated agro-ecosystem of trees, shrubs, vines, and herbaceous perennials producing food in every layer. After several years of sheet-mulching work parties, problems with weeds and insect pests, and challenges from neighbors and city regulations, the friends have created a bountiful garden oasis of more than 200 edible plants offering fresh, four-season produce: salad greens from their greenhouse in winter; perennial vegetables in spring; annual and perennial berries in the summer; and tree fruits, nuts, root crops, and more vegetables in the fall. They are even able to devise a tropical garden of bananas, beans, and sweet potatoes in a protected front-yard microclimate, and to produce healthy, nutritious food in deep shade by introducing mushrooms into the logs bordering their garden paths. The pond they dig not only provides a wide array of edible water plants, but also serves as an “anchor of life” attracting fish, snails, frogs, dragonflies, songbirds, and small mammals. The urban garden becomes a true paradise for the young men when two talented women come into their lives. Megan’s experiences growing up in rural New York and Marikler’s expertise with farm animals in Guatemala allow them to bring creative solutions to such problems as excess compost materials. With their help, a portable outdoor fireplace is bought to burn woody stalks and produce ashes for the garden, and chickens are introduced to speed up the efficiency of composting, while producing valuable manure and eggs. White River Junction, VT: Chelsea Green Publishing, (c) 2013. This entry was posted in The Master Gardeners' Bookshelf. Bookmark the permalink.